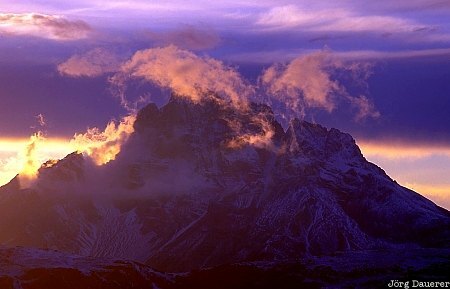 Dramatic clouds over the peaks of the Dolomite Alps illuminated by the last light of the day seen from near Tre Cime (Drei Zinnen). Tre Cime is in the province Belluno in northern Italy. This photo was taken in the evening of a sunny day in September of 2001.